Students share their RYLA experiences with the Club. From l to r: Kyle Dumont, Jordan Gauthier, Valerie Nguon, Jessica McHugh, Alex Rose, HeatherDemers and Mohamed Hamze. The 2013 RYLA students were the guests of the Club today. They came full of enthusiasm for the leadership program, and thanks to Club members for the opportunity to participate in RYLA. The Rotary Youth Leadership Awards program is an annual leadership event for high school sophomores. 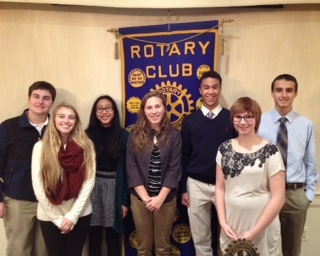 A yearly participant in the program, Dracut Rotary sent 6 students to RYLA last June. Held at Worcester State University, the weekend-long training program provides sophomores, selected by the Club earlier in the year, with an opportunity to develop their potential for leadership as they explore their strengths and abilities to solve problems and work with others. The students spoke about the highlights of the event, sharing their most memorable experiences with the Club. They all agreed that RYLA was a life changing opportunity for them. For these students, RYLA taught them that they can do anything if they believe in themselves. One student, Jessica McHugh, was not able to attend RYLA. Her soccer team was involved in the Massachusetts Tournament of Champions, competing for the state title. As captain of the team, Jessica made the decision to notify the Club that she was not going to be able to attend RYLA, freeing her space for the alternate to attend. Showing true leadership, Jessica displayed the principles of Rotary to the highest degree. The Club was truly impressed with the students’ presentations. The true value of RYLA was clearly displayed and members are looking forward to meeting a new group of RYLA students in 2014.